By: S. Bruce Archibald, Kathleen B. Pigg, David R. Greenwood, Steven R. Manchester, Lisa Barksdale, Kirk R. Johnson, Michael Sternberg, Ruth A. Stockey, Melanie L. DeVore, and Gar W. Rothwell. We dedicate this special issue on the Eocene Okanagan Highlands to the memory of Wesley C. Wehr, former Affiliate Curator of Paleobotany, Burke Museum of Natural History and Culture, Seattle, Washington, paleobotanist, artist, writer, and extraordinary friend. Although many of us knew Wes through his long history of contributions to paleontology — particularly of the Okanagan Highlands — his early training was in music. He studied music composition at the University of Washington, graduating with his BA in 1952 and MA in 1954. 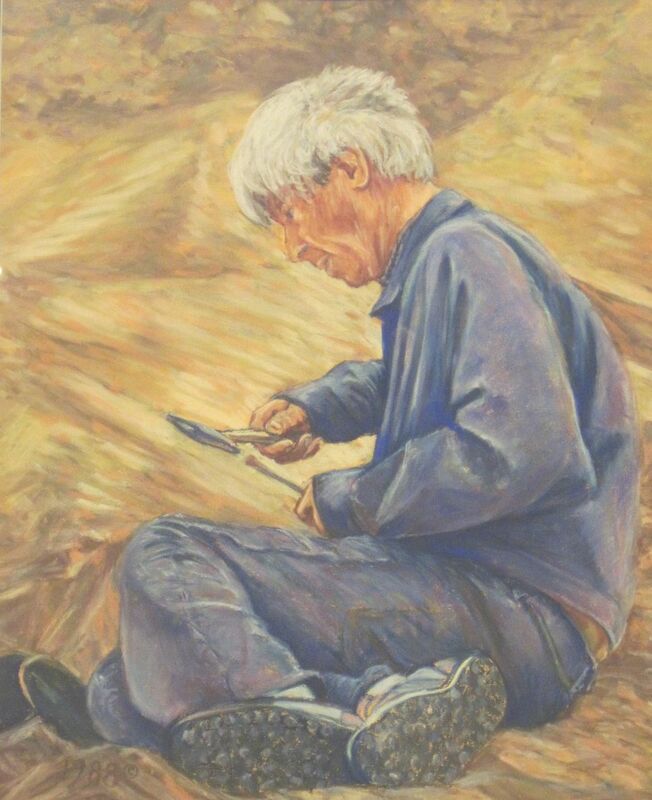 He began painting in 1960 and a career as an artist followed; his paintings and drawings continue to be featured in galleries and included in recent books on Northwest Art (e.g., Harmon and Raban 2001). Wes’s life in the worlds of science and art are chronicled in his memoirs (Wehr 2000, 2004). His love of the natural world became focused on paleobotany in the 1970s through his correspondence with prominent paleobotanists, including Chester Arnold and Charles Miller, Jr., to whom he sent numerous specimens, and through his friendship with George Beck of Central Washington University in Ellensburg, with whom he shared an interest in the petrified woods of Ginkgo Petrified Forest near Vantage, Washington. 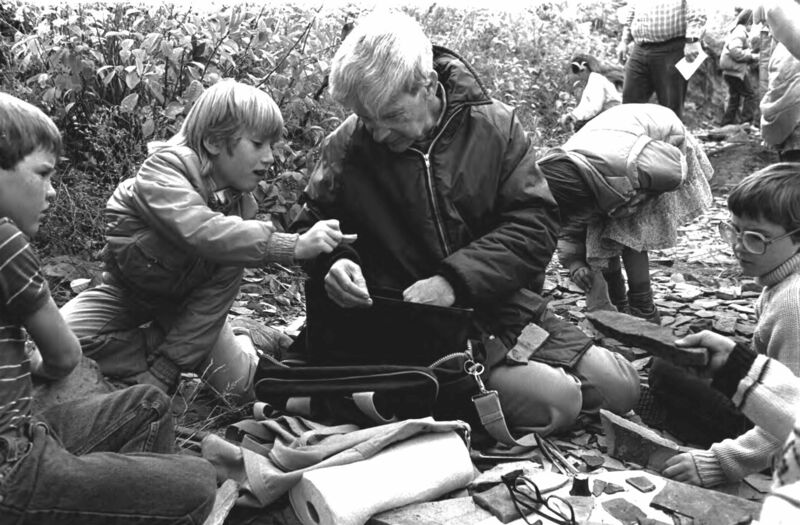 In 1977, he visited the plant fossil site at Republic, Washington with a young fossil hunting friend Kirk Johnson (now Chief Curator, Denver Museum of Nature and Science). In a trench across the street from the city hall, they together discovered the unrecognized richness of what had been thought to be a minor flora. Wes was the scientific inspiration, and co-founder with City Councilman Bert Chadwick, of Stonerose Interpretive Center in Republic. Stonerose to this day is a model of fossil locality management for the benefit of paleontology, public education, and community enrichment. In 1976, Wes became Affiliate Curator of Paleobotany at the Burke Museum of Natural History and Culture, University of Washington, Seattle, Washington, a post he maintained for the rest of his life. He authored or coauthored a series of papers on the fossil plants and insects of the Okanagan Highlands, beginning with a United States Geological Survey monograph on the Republic flora with paleobotanist Jack Wolfe in 1987 (Wolfe and Wehr 1987). Among his formal taxonomic papers were contributions on the diversification of several important temperate families, including the conifers (Schorn and Wehr 1986), Rosaceae (Wolfe and Wehr 1988; DeVore et al. 2004), Trochodendraceae (Pigg et al. 2001), Betulaceae (Pigg et al. 2003), and Hamamelidaceae (Radtke et al. in press), as well as overviews of the Okanagan floras (Wehr 1998; Stockey and Wehr 1996). Ten papers written for a general audience of fossil lovers were published in Washington Geology (see Bibliography). He is a coauthor, along with Melanie DeVore and Kathleen Pigg, of a contri- bution to this symposium (DeVore et al. 2005). Wes had a particular talent for inspiring interested adults and children alike, who would crowd around him at a shale exposure, enthralled by his ability to communicate his excite- ment for the Eocene world, urging that they, too, might make a contribution to paleontology. In the evenings during fieldwork, he sat in cafe booths writing stacks of postcards to his large circle of friends, old and new. Wes took great pleasure in introducing, or arranging meetings between, people that he felt would benefit from knowing each other, initiating friendships among a wide array of artists, scientists, and avocational paleontologists. Colleagues acknowledged Wes by naming a variety of fossil taxa for him: These include the ferns Osmunda wehrii (Miller 1982) and Wessiea yakimaensis (Pigg and Rothwell 2001); the maple samara Acer wehri (Wolfe and Tanai 1987); a winged seed of unknown affinities (the “winged stranger”) Pteronepelys wehrii (Manchester 1994) and, among insects, the brown lacewing Cretomerobius wehri (Makarkin et al. 2003). Perhaps most whimsical is the sapindaceous flower named for Wes and his paleobotanical colleague Jack Wolfe, Wehrwolfea striata (Erwin and Stockey 1990). In November 2003, Wes was presented the Paleontological Society’s Harrell L. Strimple Award, recognizing his decades of service to paleontology. Two hundred or so of his closest friends enjoyed a reception in his honour at the Burke Museum. Wes Wehr passed away suddenly on Monday, April, 12, 2004, five days before his 75th birthday. The party that he had arranged became a memorial, attended by over 200 people. He is warmly remembered by all of us. DeVore, M.L., Moore, S.M., Pigg, K.B., and Wehr. W.C. 2004. Fossil Neviusia leaves (Rosaceae: Kerriae) from the lower-middle Eocene of southern British Columbia. Rhodora, 106: 1–13. DeVore, M.L., Pigg, K.B., and Wehr, W.C. 2005. Systematics and phytogeography of selected Okanagan Highlands plants. Canadian Journal of Earth Sciences, 42: This issue. Lewis, S.E., and Wehr, W.C. 1993. Fossil mayflies from Republic, Washington. Washington Geology, 21: 35–37. Pigg, K.B., and Wehr, W.C. 2002. Tertiary flowers, fruits and seeds of Washington State and adjacent areas — Part III. Washington Geology, 30: 3–20. Pigg, K.B., Wehr, W.C., and Ickert-Bond, S.M. 2001. Trochodendron and Nordenskioldia (Trochodendraceae) from the middle Eocene of Washington State, USA. International Journal of Plant Sciences,162: 1187–1198. Pigg, K.B., Manchester, S.R., and Wehr, W.C. 2003. Corylus, Carpinus and Palaeocarpinus (Betulaceae) from the middle Eocene Klondike Mountain and Allenby Formations of northwestern North America. International Journal of Plant Sciences, 164: 807–822. Radtke, M.G., Pigg, K.B., and Wehr, W.C. In press. Fossil Corylopsis and Fothergilla leaves (Hamamelidaceae) from the lower-middle Eocene flora of Republic, Washington, USA and their evolutionary and biogeographic significance. International Journal of Plant Sciences. Schorn, H.E., and Wehr, W.C. 1986. Abies milleri, sp. nov., from the middle Eocene Klondike Mountain Formation, Republic, Ferry County, Washington. Thomas Burke Memorial Washington State Museum, Contributions in Anthropology and Natural History, 1, pp. 1–7. Schorn, H.E., and Wehr, W.C. 1996. The conifer flora from the Eocene uplands at Republic, Washington. Washington Geology,24: 22–24. Stockey, R.A., and Wehr, W.C. 1996. Flowering plants around Eocene lakes of the interior. In Life in stone — a natural history of British Columbia’s fossils. Edited by R. Ludvigsen. University of British Columbia Press and Royal British Columbia Museum, pp. 248–258. Wehr, W.C. 1994. Eocene fossil plants of the Okanogan Highlands. Douglasia, Winter: 13–14. Wehr, W.C. 1995. Early Tertiary flowers, fruits and seeds of Washington state and adjacent areas. Washington Geology, 23:3–16. Wehr, W.C. 1998. Middle Eocene insects and plants of the Okanogan Highlands. In Contributions to the paleontology and geology of the West Coast: In honor of V. Standish Mallory. Edited by J.E. Martin. Burke Museum, Research Report No. 6. Wehr, W.C. 2000. The Eighth Lively Art: Conversations with Painters, Poets, Musicians and the Wicked Witch of the West. University of Washington Press, Seattle, Wash.
Wehr, W.C. 2004. The Accidental Collector: Art, Fossils & Friend- ships. University of Washington Press, Seattle, Wash.
Wehr, W.C., and Barksdale, L.L. 1995. Implications of Middle Eocene Feathers and Crayfish from Republic, Washington. Washington Geology, 23: 6–10. Wehr, W.C., and Barksdale, L.L. 1996. A checklist of fossil insects from Republic, Washington. Washington Geology, 24: 29. Wehr, W.C., and Hopkins, D.Q. 1994. The Eocene orchards and gardens of Republic, Washington. Washington Geology, 22: 27–34. Wehr, W.C, and Manchester, S.R. 1996. Paleobotanical significance of Eocene flowers, fruits, and seeds from Republic, Washington. Washington Geology, 24: 25–27. Wehr, W.C., and Schorn, H.E. 1992. Current research on Eocene conifers at Republic, Washington. Washington Geology, 20: 20–23. Wolfe, J.A., and Wehr, W. 1987. Middle Eocene dicotyledonous plants from Republic, northeastern Washington. US. Geological Survey, Bulletin 1597, pp. 1–25. Wolfe, J.A., and Wehr, W. 1988. Rosaceous Chamaebatiaria-likefoliage from the Paleogene of western North America. Aliso,12: 177–200. Plants at Republic, Washington. Washington Geology, 19: 18–24. Erwin, D.M., and R.A. Stockey. 1990. Sapindaceous flowers from the Middle Eocene Princeton chert (Allenby Formation) of British Columbia, Canada. Canadian Journal of Botany, 68: 2025–2034. Harmon, K., and Raban, J. 2001. The Pacific Northwest Landscape: A Painted History. Sasquatch Books, Seattle, Wash. Early Eocene Brown Lacewings (Neuroptera: Hemerobiidae) from Western North America. The Canadian Entomologist, 135: 637–653. Manchester, S.R. 1994. Fruits and seeds of the Middle Eocene Nut Beds flora, Clarno Formation, North Central Oregon. Palaeon- tographica Americana, 58, pp. 1–205. Miller, C.N., Jr. 1982. Osmunda wehrii, a new species based on petrified rhizomes from the Miocene of Washington. American Journal of Botany, 69(1): 116–121. Pigg, K.B., and Rothwell, G.W. 2001. Anatomically preserved Woodwardia virginica (Blechnaceae) and a new filicalean fern from the middle Miocene Yakima Canyon flora of central Washington, USA. American Journal of Botany, 88: 777–787. Wolfe, J.A., and Tanai, T. 1987. Systematics, phylogeny, and distri- bution of Acer (maples) in the Cenozoic of western North America. Journal of the Faculty of Science, Hokkaido University, Series IV, 22, pp. 1–246.